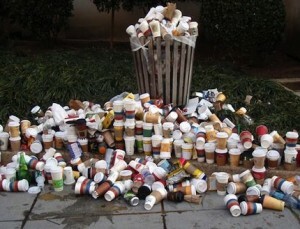 Did you know that the paper cup used for your on-the-go coffee is probably not compostable? The thin plastic coating that keeps most cups from turning to mush makes them non-compostable. * And your morning coffee’s paper cup is recyclable only if you have first rinsed it clean of all coffee and milk. But even if cups are composted or recycled, it still requires enormous amounts of energy and resources to manufacture and ship them. We want to keep hundreds of thousands of paper cups out of the landfill and we hope you will participate with us in this effort. 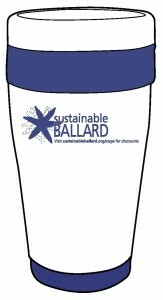 Sustainable Ballard now has a reusable coffee mug, available for a suggested donation of $20, with a bonus — discounts at local coffee shops! Join the Reusable Cup Campaign! Get yours at the Open House + Annual Meeting on Saturday, January 23rd, 2pm-4pm @ Ballard Public Library. Volunteer Needs: Visit or call coffee shops to ask about discounts and paper cup use, look for more partners to offer reusable cup discounts! *Some paper cups are commercially compostable. For example, the hot and cold cups used by Equal Exchange Espresso Bar @ Ballard Market are compostable because they have a plastic lining of PLA (polylactic acid, derived from renewable resources), whereas most cups are lined with polyethylene, a non-compostable plastic.